Simple trip, stumble - acl reconstruction ! On Sept. 17, 2008, experienced a simple, seemingly innocuous stumble, trip. Well, this simple trip ripped my acl and both meniscus. This happened during my last 3 days of working for a chain pharmacy, wherein you stand for 12 hrs, almost literally in a small confined space, with scant walking, movement. So I had to stand and work on this injury for 3 days before retiring, and, that made it worse. My wife had 2 trips planned to Vegas and NYC, so I was hesitant to start anything in light of that. So, I continued doing all my outside work, roofing, etc, and, went on these trips to NYC and Vegas. I tore off an extension to one of my outbuilding, hauled logs out of the woods, did a lot, then, hoofed it for miles in NYC, and Vegas. I ended up in a wheel chair in Vegas finally, then had to stay on crutches until I finally decided on surgery. 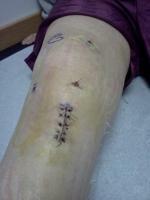 I had visited a local orthopod about 1 month or so after injury, who diagnosed the torn acl and both meniscus injuries. He kept focusing on my 62 year age, and hesitance to reconstruct. He wanted to simply trim both meniscus and, let me baby my knee rest of my life. Well, my boy is a physician in Lake Norman, and, wanted me to come there to have it done, and help me. I visited his friend, Dr. David Hillsgrove, at Northshore Orthopedics, who operates at Lake Norman Region Medical Hospital. He assessed me, said he could reconstruct , no problem, use a hamstring graft, as long as I would stay there for at least one month post op, so he could watch me. I agreed, had it done on Nov.19th, and, it was painful for 4 or 5 days, but i am very happy with the progress, as are the doctor and physical therapist. Actually , he released me to go back up north to home after 2 weeks due to my rapid progress and healing. knee, which I liked. It made me feel secure and my knee protected, even though numerous studies show no difference in outcome. I liked it. It bent my knee and kept it flexible, and, I could adjust the degree of flexion to achieve the 90 degree goal in a few days. Physical therapy went well, and, I did my exercises and regimen quite religiously, as my goal was to return to normal as soon as possible, with a strong, normal knee. Hence my decision to go the tougher route and have reconstruction. I am home now, still in rehab, probably for 4 or 5 more weeks, but, it is well worth it, and the coaching and therapy is well worth it. I would advise anyone that wants a normal knee, does not want to baby their knee the rest of their life, to go through with reconstruction, as long as you are motivated enough and able to do the rehab. The first few weeks of course are the worst, but, so far, I am into my first month, up walking quite well as of 3 weeks, was driving after 2 weeks, and, am quite happy with the outcome. Of course, I have to give accolades to my physician, and, the great physical therapists also, Sasha and Gisela at the Lake Norman Hospital in North Carolina. Lot tougher road than just cleaning up the meniscus, whereupon you can return to work, life much sooner, but, I feel like I will have a much stronger, normal knee for the rest of my life. It does help that I am retired and can devote the time to it. 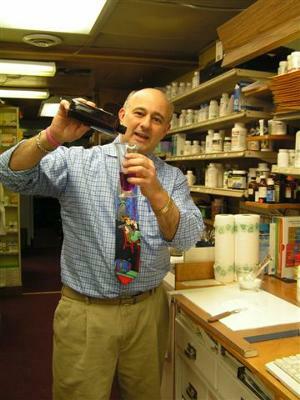 Would have been much, much more difficult if I were still operating my own pharmacy. In summation, has been very well worth it, would recommend it to anyone with the proper qualifications. Technology and talent in medicine today is absolutely amazing and astounding, - and oh how casually we take for granted the sacrifices these doctors make to get to where they are to do what they do for us! Just mind boggling and amazing.